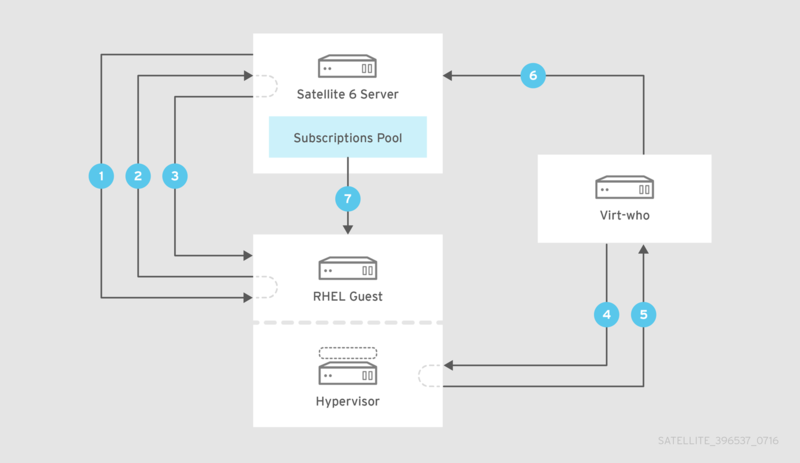 This guide provides information on how to apply Virtual Data Center subscriptions, configure the virt-who service, and register virtual instances with Red Hat Satellite 6.2. Red Hat recommends a subscription that allows virtual machines to inherit subscriptions, since this allows for flexibility when provisioning virtual machines. However the choice is yours, and should be made according to your requirements. If you are unsure which subscription best meets your needs, contact your Red Hat account manager for advice. For more details of the Red Hat subscription model, see Subscription Concepts and Workflows. Ensure that a manifest including a VDC subscription has been uploaded to Satellite Server. See Importing a Subscription Manifest into the Satellite Server in the Content Management Guide. Install and configure the virt-who service. See Chapter 5, Configuration and Services. Attach a VDC subscription to the hypervisor. To attach a VDC subscription to a hypervisor using the web UI, click Hosts → Content Hosts, select a host, and click Subscriptions → Subscriptions. Click Add, select the desired subscription, and click Add Selected. Restart the virt-who service so that the hypervisor and virtual machine mapping information is sent back to Satellite. Register virtual machines with an activation key that has auto-attach enabled and no subscriptions attached. This way, the virtual machines will inherit the VDC subscription from the hypervisor. As the subscription manager doesn’t yet know to which host the virtual machine belongs, a temporary subscription is granted, valid for a maximum 24 hours. When a virtual machine is first registered, Satellite does not know with which virtualization manager or hypervisor the virtual machine is associated and so cannot assign a subscription. In this case a temporary subscription is granted, valid for a maximum period of 24 hours. When the virt-who daemon next runs and identifies the virtual machine’s host, a permanent subscription is applied, provided the host has available subscriptions of the right type. If a permanent subscription is granted, the virtual machine’s subscription status is changed to Subscribed. A virtual machine that has been granted a temporary subscription might, after the 24-hour period, automatically select a subscription intended for a physical host and so restrict the number of subscriptions available. When the 24-hour period expires, the host’s status is changed to Not subscribed if it has been unable to request a suitable subscription. If you do not want to wait for up to 24 hours to pass, or you want to assign a specific subscription, install and configure virt-who, then manually assign the desired subscription. A single virt-who instance can report to the Satellite Server virtual machines which are associated with multiple organizations. Individual configuration files are recommended for each organization. A single virt-who instance can connect to multiple hypervisors and report the virtual machines hosted by each. Individual configuration files are recommended for each hypervisor or virtualization manager as it makes troubleshooting easier. For example, if you suspect a hypervisor is causing a problem, you can move that hypervisor’s configuration file to another directory, stopping virt-who from querying it and so eliminating it from the problem’s scope. A single virt-who instance can connect to virtualization platforms of multiple supported technologies. Individual configuration files are recommended for each platform. To workaround these issues, you can configure virt-who to use no proxy, configure the HTTP proxy to allow local network traffic through, or configure an additional squid proxy. For further details, see Section 6.5.3, “Virt-who attempts to connect to virtualization manager or hypervisor via an HTTP proxy on the local network fails”. If you require virt-who to use a different proxy than what Satellite Server uses to connect to external networks, see Section 6.5.4, “Configure virt-who to use an internal proxy” for further details. Create an account on each virtualization manager, such as VMware vCenter and Red Hat Virtualization Manager, or individual hypervisors so the virt-who agent can retrieve the list of guest virtual machines. Each connection is separate, so you can use different accounts for each connection if required. Each account, generally known as a service account, should be dedicated to this purpose, have read-only access, and have a non-expiring password. The virt-who daemon must be installed on Red Hat Enterprise Linux, version 7 (recommended) or 6. For Red Hat Enterprise Linux hypervisors, the virt-who daemon must be installed on the hypervisor. For all other hypervisors, the virt-who daemon can be installed on the Satellite Server, an external Capsule Server, or a dedicated instance of Red Hat Enterprise Linux. Except for Red Hat Enterprise Linux hypervisors, Red Hat recommends installing virt-who on the Satellite Server, because it simplifies the network configuration and provides maximum availability. If you install virt-who on a dedicated instance of Red Hat Enterprise Linux, this host does not have to be registered to the Satellite Server. Subscriptions are specific to organizations. Although you can configure the virt-who daemon to support multiple organizations, you cannot share subscriptions across organizations. You must have one virtual data center subscription for each organization and for each hypervisor. Skip this procedure if virt-who is to be installed on the Satellite Server, an external Capsule Server, or a Red Hat Enterprise Linux hypervisor. Before installing the virt-who daemon, a Red Hat Enterprise Linux instance must be installed and configured as follows. To enable virt-who to communicate with the subscription service, TCP port 443 must be opened. Subscribe to the Satellite Tools repository for 6.2. Verify that the server is subscribed to the Satellite Tools repository for 6.2. If the output of this command lists the Satellite Tools repository for 6.2 then the subscription has been successful. The virt-who package is available both from the Red Hat Satellite Tools and the Red Hat Enterprise Linux repository. The latest version of the package will be installed by the yum utility. If you run a hybrid environment, with virtual machines running Red Hat Enterprise Linux and other operating systems, you might want to limit the scope of virt-who’s access to hosts. For example, if some hypervisors host only Microsoft Windows Server instances, there is no benefit in having those hypervisors reported by the virt-who agent. To limit virt-who’s access to hosts (hypervisors), use one or both of the following methods. Both methods achieve the same objective, but the include or exclude method should be considered the default since it is a native feature of virt-who. List hosts to be included or excluded. Limit access to only a subset of hosts. To either include or exclude hosts being reported by the virt-who daemon, list them in the virt-who configuration file, separated by commas. If a host’s name contains special characters, enclose it in quotation marks. To include hosts, use the filter_hosts parameter. To exclude hosts, use the exclude_hosts parameter. Only one of these methods can be used in each virt-who configuration file. The method of identifying hosts to be included or excluded must match the method you specified to have them identified in the Satellite web UI. If you specified hypervisor_id=hostname, then you must list the hosts' names. If you specified hypervisor_id=uuid, or hypervisor_id=hwuuid, then you must list the hosts' UUID or HWUUID respectively. The filtering parameters filter_host_uuids and exclude_host_uuids have been deprecated. Create a Satellite user with Administrator access. This account is used to allow virt-who to connect to Satellite. Red Hat recommends the account be used for only this purpose. If you have previously created a Satellite user for this purpose, skip this step. For help creating the user using the Satellite web UI, see Creating a User in the Server Administration Guide. For help creating the user using the Hammer CLI, see Creating Users in the Hammer CLI Guide. Encrypting the virt-who account password provides greater security compared with storing the password in plain text. The root account must encrypt the password because the encryption key is written into a file that is only readable by the root account. For that reason, only the root account can decrypt the password. Enter the password of the account to connect to the hypervisor. The encrypted form of the password is output to the screen. Make a note of the encrypted password. This is used later in the virt-who daemon’s configuration. Repeat this procedure for each Red Hat Enterprise Virtualization Hypervisor (RHEV-H) host to which this instance of virt-who is to be connected. Encrypt the password of the account to be used to connect to the Red Hat Enterprise Virtualization Manager instance. Use the virt-who-password command to encrypt the password. For an example, see Section 5.2, “Creating a User for virt-who”. Copy the template configuration file to a new file. To make it easy to identify the configuration file for each hypervisor, use the RHEV-H host’s name as the new file’s name. In this example, the host name is rhevmhost1. Edit the configuration file you just created, changing the example values with those specific to your configuration. This must be unique for each virt-who instance. Use the Red Hat Virtualization Manager host’s name to make it easy to identify the configuration file for each hypervisor. The type=rhevm specifies that this virt-who connection is to a Red Hat Virtualization Manager. Specifies that hypervisors will be identified in the Satellite web UI by their host name. The default is to use the hypervisor’s UUID, which is less meaningful. Organization’s label. To list available organizations, enter the following command: hammer organization list. Identify which organization you want the virtual hosts to be assigned to, and use the matching entry in the LABEL column. This specifies the environment in which the host will be placed and must be Library. Red Hat Enterprise Virtualization Manager’s fully qualified host name or IP address. The default port number is 8443, but port 443 is used by Red Hat Enterprise Virtualization Manager after version 3.0. Account name by which virt-who is to connect to the Red Hat Enterprise Virtualization Manager instance. The username option requires input in the format username@domain. Note that the read-only access is not sufficient to be able to acquire the Red Hat Virtualization Hypervisor host information via virt-who. It is necessary to create a new role in the Red Hat Enterprise Virtualization environment with the Admin account type and Login Permissions enabled only and assign this role to the user. Encrypted password for the account specified by username. Configure virt-who to report to the Satellite Server. Add the following configuration lines, replacing example values with those specific to your environment. Satellite user, used by the virt-who daemon to connect to the Satellite Server. This was created in Section 5.2, “Creating a User for virt-who”. Encrypted password for the user specified by rhsm_username. This was created in Section 5.2, “Creating a User for virt-who”. Complete this procedure on each Red Hat Enterprise Linux hypervisor. Configure the Red Hat Enterprise Linux hypervisor to register to the Satellite Server. Register the Red Hat Enterprise Linux hypervisor to the Satellite Server. Attach the VDC subscription to the Red Hat Enterprise Linux hypervisor. To find the required subscription pool ID, list all available subscriptions. To make it easy to identify the configuration file for each hypervisor, use the hypervisor host’s name as the new file’s name. In this example, the host name is rhelhost1. Red Hat Enterprise Linux Hypervisor’s FQDN. The type=vdsm parameter specifies that this virt-who connection is to a Red Hat Enterprise Linux hypervisor. This completes the configuration required for a Red Hat Enterprise Linux hypervisor instance. When registering a virtual machine hosted on this Red Hat Enterprise Linux host, you need to use an activation key that has auto-attach enabled and no subscriptions attached. This way, the virtual machine will inherit the VDC subscription from the hypervisor. Configure the virtual machine to register with Satellite Server. Register the virtual machine. The activation key created for VDC subscription has to be listed first. Add a secondary key for additional product subscription if required. Enable the desired repositories for the system. Complete this procedure on each Red Hat OpenStack Platform compute node. Configure the Red Hat OpenStack Platform compute node to register to the Satellite Server. Register the Red Hat OpenStack Platform compute node to the Satellite Server. Attach the VDC subscription to the Red Hat OpenStack Platform compute node. To make it easy to identify the configuration file for each hypervisor, use the hypervisor host’s name as the new file’s name. In this example, the host name is rhosphost1. Red Hat OpenStack Platform compute node’s FQDN. The type=libvirt parameter specifies that this virt-who connection is to a Red Hat OpenStack Platform compute node. Specifies that hypervisors (compute nodes) will be identified in the Satellite web UI by their host name. The default is to use the hypervisor’s UUID, which is less meaningful. This completes the configuration required for a Red Hat OpenStack Platform compute node. When registering guest virtual machines hosted on this Red Hat OpenStack Platform compute node, it is important that they use the subscription attached to the compute node. Configure the virtual machine to register with the Satellite Server. Ensure the subscription pool is the same as that used for the compute node. The virtual machine will obtain a subscription from the Satellite Server. For details of this process, see Section 1.4, “Virtual Machine Subscription Process”. Repeat this procedure for each VMware vCenter host to which this instance of virt-who is to be connected. Encrypt the password of the account to be used to connect to VMware vCenter. To make it easy to identify the configuration file for each hypervisor, use the VMware vCenter host’s name as the new file’s name. In this example, the host name is vcenterhost1. This must be unique for each virt-who instance. Use the VMware vCenter’s host name to make it easy to identify the configuration file for each hypervisor. The type=esx parameter specifies that this virt-who connection is to a VMware vCenter. VMware vCenter server’s fully qualified host name or IP address. Account name by which virt-who is to connect to the hypervisor, in the format domain_name\account_name. Note that only a single backslash separates the values for domain_name and account_name. If you are using a domain account, and the global configuration file /etc/sysconfig/virt-who, then two backslashes are required. For further details, see the Red Hat Knowledgebase solution How to use a windows domain account with virt-who. The virt-who utility does not currently support Microsoft System Center 2012 R2 Virtual Machine Manager (SCVMM). There must be a virt-who configuration file for each Microsoft Hyper-V host to which virt-who is to connect. Repeat this procedure for each Microsoft Hyper-V host to which this instance of virt-who is to be connected. Enable Windows Remote Management and either the HTTP or HTTPS listener must be running. Enable remote administration on the Microsoft Hyper-V server. If you are using HTTP, enable the unencrypted connection. Verify that the authentication method configured on the Microsoft Hyper-V server is either Basic or NTLM. DESCRIPTION: Satellite organization’s description (optional). Identify to which organization you want the virtual hosts assigned, and note the matching entry in the LABEL column. This will later be used in the virt-who configuration. Encrypt the password of the account to be used to connect to the Microsoft Hyper-V server. To make it easy to identify the configuration file for each hypervisor, use the Microsoft Hyper-V server’s host name as the new file’s name. In this example, the host name is hypervhost1. This must be unique for each virt-who instance. Use the Microsoft Hyper-V host’s name to make it easy to identify the configuration file for each hypervisor. The type=hyperv specifies that this virt-who connection is to a Microsoft Hyper-V host. Microsoft Hyper-V fully qualified host name or IP address. Account name by which virt-who is to connect to the hypervisor. By default this is Administrator. To use an alternate account, create a user account and assign that account to the following groups (Windows 2012 Server): Hyper-V Administrators and Remote Management Users. Configure the virt-who service for Satellite. Edit the global /etc/sysconfig/virt-who configuration file and set the following parameter as shown. This specifies that virt-who is to be communicating with a Satellite host. By default virt-who initiates a scan hourly. The interval is defined by the VIRTWHO_INTERVAL global configuration parameter and measured in seconds. It should ONLY be changed on advice from Red Hat Support. Allow for an HTTP proxy between virt-who and guest virtual machines. If there is an HTTP proxy between the server on which virt-who is running and the hypervisors or virtualization managers, edit the global /etc/sysconfig/virt-who configuration file and set the following parameter as shown. Run the command virt-who --one-shot which reads all configuration files, retrieves the list of virtual machines from all sources, then exits immediately. This tests the configuration files, credentials, and connectivity to configured virtualization platforms. The output is a list of hypervisors and the hosted guest virtual machines, in JSON format. The following is an extract from virt-who output from a VMware vSphere instance. The output from all hypervisors follows the same structure. Start and enable the virt-who service. Verify that the virt-who service started successfully. The output from this command should be similar to the following. The virt-who.service; enabled output confirms it is enabled and Active: active (running) confirms it is started. The output from this command should be similar to the following. Verify that the hypervisors appear in the Satellite web UI. In the Satellite web UI, select Hosts → All hosts and confirm that the host (hypervisor) system profiles display. The prefix virt-who- was added to make it easier to identify hypervisors. The suffix organization_ID was added to ensure that hypervisors' names were unique, since a hypervisor can be registered with multiple organizations. Assign a subscription to the hypervisor. Open the virtual machine profile from the Hosts page. In the Details tab, the virtual machine displays as Virtual Host hostname. Click the hostname link that opens the host system profile. In the Subscriptions tab, assign the subscription to the host system. If you have multiple hypervisors running Red Hat Enterprise Linux guests, attach a subscription to all the hypervisors. To detect duplicate lines in the virt-who configuration files, use the following command. The output of this command is a list of all lines in the specified files, prefixed by the number of times it occurs. Check all instances where the same line is listed as occurring twice or more, remove the duplicate line and restart the virt-who service. For instructions see Section 5.8.1, “Restarting the virt-who Service”. Check the Red Hat Subscription Manager log file - /var/log/rhsm/rhsm.log - if virt-who fails to connect with the virtualization platform. If you find the message No route to host, one possible reason is that the hypervisor is listening on a port other than what you expect. For example, Red Hat Virtualization Manager defaults to port 8443 for backward compatibility, but virt-who defaults to using port 443. In this case, you would edit the hypervisor’s configuration file in /etc/virt-who.d/ and append :443 to the value for the server line, resulting in the line: server=https://rhevmhost1.example.com:443. You can also consider to configure virt-who to use no proxy by adding NO_PROXY=* to /etc/sysconfig/virt-who. Note that the values in /etc/sysconfig/virt-who are environment variables, and are sourced during daemon runs. If running virt-who in one-shot mode, export the values in /etc/sysconfig/virt-who first. Note that the required package versions are: python-rhsm >= 1.17.9-1 and virt-who >= 0.17-11.